lauramaynot & LMB Babywearing. Supporting and helping families and building community. 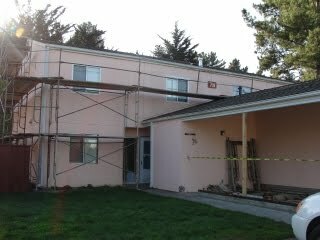 This past summer the coast guard started construction on our housing. 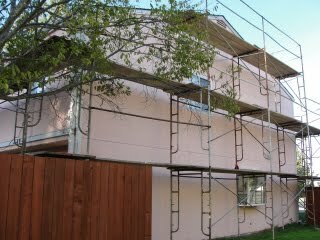 They are removing the stucco and replacing it with nice siding, replacing the windows and doors, and enclosing our carport into a garage. Sounds great eh? Well last week they finally got to us. 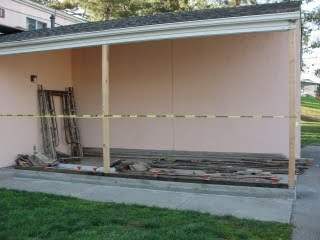 They poured the footings for our new garage and changed out the support beams. 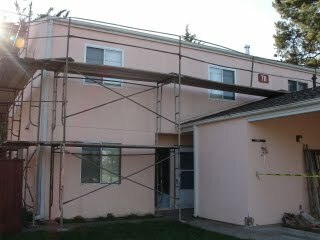 They set up scaffolding all around our house as well. 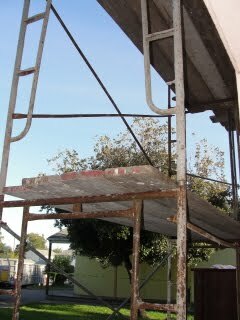 Yesterday they started demolition on our neighbors house so as you can imagine, it is now a construction zone in our yard! Very dusty, dirty and NOISY! 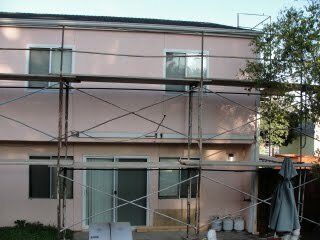 I thought I would take some pics of their progress as it moves along and post them here. Hopefully we will have a fancy new house in the next couple of months! Laura Bunnell is the mother of eight children and has been babywearing since the birth of her first child in 1996. Being a busy mother of a large family and wife of a member of the US Coast Guard who moved often, she found a supportive community online that quickly became her life line in early 2006 while she was expecting her fourth child. She served as a moderator for Thebabywearer.com (TBW) from 2010 to 2013, and currently serves as an administrator. She has been advocating and educating since 2008. Beginning in October 2014, Laura served as a Volunteer Babywearing Educator (VBE) for BWI of the Bay Area, where she was a meeting leader and librarian for the Marin subchapter. She also led an independant group - Sonoma County Babywearing Enthusiasts. She trained with Center For Babywearing Studies in July 2016. In 2017, she began working with The Carrying On Project, a non-profit organizaton that connects military families with baby carriers, babywearing resources and education. She is currently the south east distributor for the org.